With cascades of blousy, double, violet-blue flowers, this is a patio climber that will really work for its keep! A Premium Double Flowered Clematis, expertly bred by the world-renowned, award-winning nurseryman Raymond Evison. Easy to grow and maintain but extremely rewarding, an absolute showstopper! 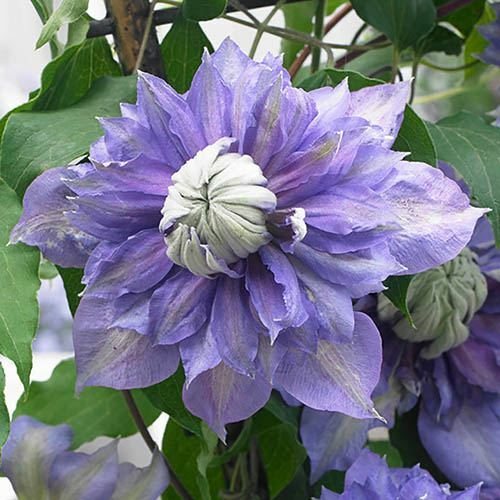 Expertly bred by world-renowned Clematis specialist Raymond Evison, these wonderful, compact clematis plants will adorn any pergola or trellis all summer-long with their fully-double, exotic-looking violet-blue flowers - up to 15cm across! Ideal for a small garden or for growing in a container, 'Diamantina' was launched in 2010 at the RHS Chelsea flower show and has an excellent pedigree. Bred specifically for smaller gardens and patios, where conventional clematis can be too vigorous, they have a much-reduced height at 2m or so, and a much higher, longer-lasting flower count. A superb, repeat-flowering, double clematis, each individual flower of Diamantina will last up to 4 weeks, producing a cascade of large flowers in early summer and again in later summer/early autumn. Plants will always produce double flowers even after a hard winter. Supplied as an established plant in a 7cm pot, ready to plant out.